Today is National Hat Day, and we’ve seen quite an assortment of caps over the years here with the Altoona Curve. We took a look at some of the caps worn around here a few years ago, but with two new caps on the way in 2018, it seemed like a good time to update the archives. We unveiled two new on-field caps that we will see in the 2018 season back in December. 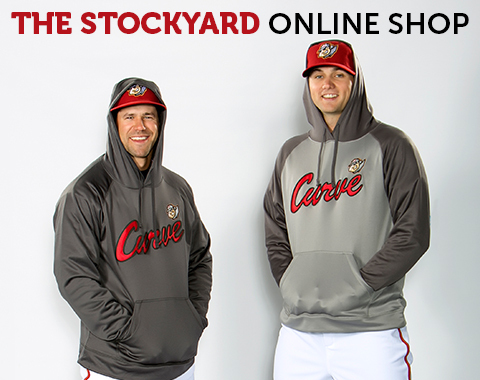 They’ll be available in the Stockyard as the season gets a little closer. A fresh update for an old favorite. Along with these two caps, the team will still be wearing their grey cap and the “Curve C” cap in 2018. Let’s take a look at some of the other hats the team has worn over the first 19 years of Curve baseball. The original. The black cap with a red bill and the original “A” logo, with a smoking baseball passing through the archway. This cap was used from 1999-2010 and made a return for “Throwback Thursdays” during the 2016 season. The original, but inverted. This hat started its rotation around 2003. Beginning around 2004, the Curve added an option with a green bill to match one of their primary colors at the time. The all-black original Curve cap. Used from 1999-2010. Revealed in 2011, this all-red cap was the Curve’s primary on-field lid from 2011-2017. Featuring the popular “Curve C” logo with a baseball steaming through some train tracks, this alternate cap is red with a black bill and is still in use on field today. The all-black “Keystone A” cap was the team’s BP lid from 2011-2017 and was occasionally used in games. The all-grey hat with the engineer logo debuted in 2011 and is still in use for 2018. In 2008, the Curve wore these “fauxback” uniforms for Sunday home games as a throwback to the early days of baseball in Altoona. These black caps were worn during the “Ghostman Games” for the 2014 All-Star Stop at PNG Field. The all-black Steamer hat was worn in August of 2015 with a green jersey to celebrate the retirement of the Curve’s long-time mascot, Steamer. In 2017, the Curve wore these black and gold uniforms with a gold “Keystone A” logo, a nod to their long affiliation with the Pittsburgh Pirates. Every year, New Era releases these red, white and blue “Stars & Stripes” caps for major and minor league teams around baseball for Independence Day. You can grab your Curve hats here to gear up for Opening Day as the team returns to action at PNG Field on April 5 against Akron.